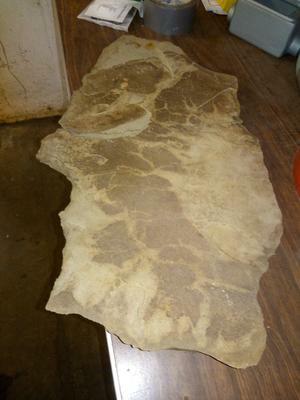 A surface rock I found and split open in Westfield, NY about 1 mile from Lake Erie. I can't tell if it's just an interesting looking rock, but I see patterns. Comments for rock or fossil?? Does anyone else see something shrimp-like in the picture? Anomalocaris canadensis had forelimbs that look like shrimp. 500MYA is too old to be local but I found it in glacial till. My object is about 40cm long. I don't know what you have there but... The area around you is from the Devonian Period. Fossils are commonly found near there including brachiopods (lamp shells), pelycopods (clams), and bryozoans (moss animals). This doesn't look like any of those. Here is a pdf that has a wealth of info about fossils near you.